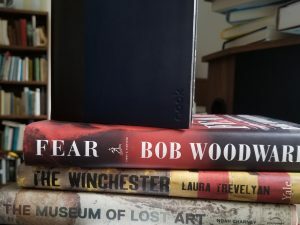 I had set myself a goal on GoodReads of 50 books in 2018 and got to 34 ½. I also determined that I would post on every book I read in this blog. Well, that’s two resolutions not kept. The Woman in White (1860), the “1/2” of “34 1/2”, ran over into 2019. It’s unnecessarily long in my opinion although 19th century readers, undistracted by other entertainments, must have enjoyed the detail. 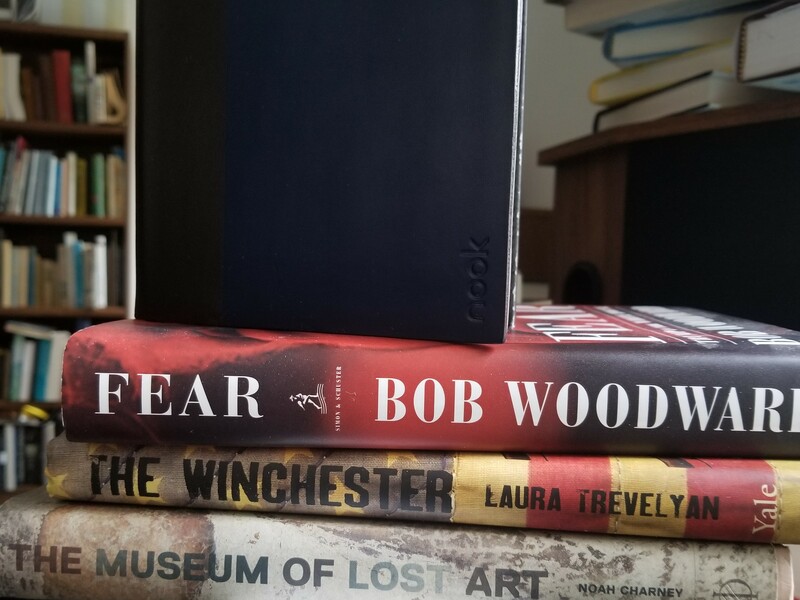 My questionable motivations for reading the book included finding something cheap on my e-reader and something I thought would be quick and easy. My cousin the author Doug Preston, no slouch he when it comes to writing thrillers, has cited Wilkie Collins, and especially The Woman In White, as an influence and I was curious about that. And last but not least, My Dear One and I had just watched a 2018 television adaptation which I had snoozed partway through and whose story line had gotten away from me. The worst of the bunch was, without a doubt, Trevelyan’s The Winchester (2016) and Yale University Press should be ashamed for publishing such dreck. I ordered it by mistake, having in mind The Gunning of America (2016) by Pamela Haag, a book I still have not read. Mostly it was Trevelyan carrying on in tedious detail about her Winchester ancestors and their wealth. Reading the book is probably worth the effort for a gun enthusiast or a person fascinated by the emergence of economic barons in 19th century America. Or possibly devotees of the mythology of the Wild West. Otherwise it seems primarily like a vanity project. Coming in a close second is Noah Charney’s Museum of Lost Art (2018). Damn shame because I really enjoyed his Stealing the Mystic Lamb (2010). I teach art history and seek out books that at least peripherally widen or deepen my thinking. The thing is a sloppy job, full of typos. Charney jabs at specific works and doesn’t bring any of the stories to a conclusion, literary or factual. I guess he has found a niche. Wish he was filling that niche in a more respectable way. Chad Harbach’s The Art of Fielding (2011) turned out to be less than the broo-ha-ha back in 2011 and 2012 might have led one to expect. Coming of age stories wrapped up in sports stories are standard fare. Add in a subtext about sexual identity with a May-December romance and the narrative becomes topical. A soupçon of feminist rebellion and all of the bases are covered, one might say. Gutenberg’s Apprentice (2014) by Alix Christie and The Book Thief (2005) by Markus Zusak make the making of books and the making of a person inextricable. Both protagonists tell the story in a way that combines diaristic notations with the insights of hindsight. Peter Schoefffer, the eponymous printer, unfolds his story to the historian-priest, without whom we might today have no idea at all of the inventor. Liesl Meminger is less a thief of books than a savior. The illiterate child eventually masters the word, first reading it and then writing it, and it is her writing that Death, the narrator, shares with us. Both characters live lives that include beauty that is transcendent and horrors that are mundane and inescapable. I is an Other (2011) by James Geary was great fun. Fear (2018) by Bob Woodward was not fun. I wouldn’t think of them as similar exactly but both focused on language, how we use it and the results that ensue. As of this moment, two-plus years of Trumpisms amplified by his Cult members and dignified by a GOP degraded from the Party of Lincoln into the Party of Old White Male Supremacists has sent me to my dentist for a mouthpiece that protects me from the nocturnal teeth-grinding that is now my habit. I’ve dialed back my ambitions for 2019 to thirty-five books. As I look over the 2018 list, it occurs to me that my tastes are pretty scattershot. There are few themes—although sometimes I will follow an interest for a while. Every now and then I recognize the far more disciplined reader I was when I was in my late teens and twenties when I read things often because they were classics and I thought I ought to read them. According to GoodReads, I am one book ahead of schedule as they count The Woman in White in the 2019 tally. I have also whipped through the latest Pendergast thriller, Verses for the Dead, that cousin Doug wrote with Lincoln Child. Entertaining as I expected although not among my favorites of the eighteen written so far. As for the blog? I think I’ll try to write more about art this year.